Loads of video games (and movies, and TV shows, and comics, and books) have maps in them. You might think they’re there to stop you getting lost, but no. They’ve got a much more important role than that. 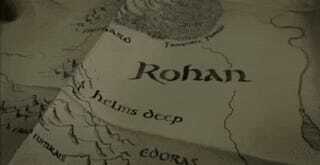 There’s a scene in Lord of the Rings: The Two Towers where Faramir and his ranger buddies are hiding in a cave, and a map is shown (above). Fingers—actually those of director Peter Jackson—run all over the it as the current strategic situation of the entire trilogy is laid out. We see the major cities and locations, we see the movement of armies, we get an idea not of what a few stars are up to, but how the world itself is changing. In the commentary for the movie, Jackson describes how he only added the scene in later when he realised something was missing from the film, and how important such a seemingly trivial matter ended up being to the audience’s relation to the entire trilogy. He knew, as many video game developers do, that maps are the gateways to a fictional world. Sure, stuff like “lore” and cutscenes and narration play a part, but when it comes down to it, there’s a great irony at play: if a creator wants someone to really get lost in their world, they’re going to need to draw them a map. You might think a map is just a map. A thing with some locations stamped on it that you use to get from one place to another. And that’s true! They are, but a good map doesn’t just show towns and castles, it provides scale, which in turn provides meaning to movement and distance. It’s one thing being told about a long walk. It’s another knowing just how long it was. Why do you think the very introduction sequence to Game of Thrones begins with a sweeping overview of a world map? Because it provides context to everything that’s about to happen. When you see how far Tyrion has travelled to get to Daenrys, or how just how far Winterfell really is from King’s Landing, or how crazy it is that Stannis ended up at The Wall, you get an understanding of task and accomplishment that no amount of make-up, heavy breathing or expletive-riddled dialogue can account for. But a map can also play a narrative role. Nothing piques curiosity more than the unexplored quarters of a map. They suggest mystery, excitement, danger. There’s nothing out there that will excite a gamer more, or get them moving in a game faster, than giving them a map with empty/incomplete areas and saying “have at it”. Look at video games that have embraced the importance of maps, and how much they benefit from it as a result. And I’m not talking about games that only include one so you know how to get from A to Z.
BioWare do a fantastic job; both Mass Effect’s galactic map and Dragon Age’s war table put a whole universe/world at your fingertips. Bethesda’s work with Elder Scrolls also excels, with Skyrim’s map in particular acting not just as a map, but as a tool for travel and a journal of tasks just begging to be uncovered and completed. And don’t get me started on classic JRPG overworlds like Final Fantasy VII (or even Bravely Default’s), which aren’t just maps, they turn the world itself into a plaything. But it’s not just RPGs that are made better with good maps. Even the humble platformer is made more complete with one; Super Mario World may superficially be a collection of levels, just like its predecessors, but by linking everything together with an overworld map (a tradition that’s continued through to Super Mario 3D World on the Wii U), your efforts are made to feel more like a journey, rather than a gated progression through isolated, individual stages. So the next time you hit the “M” button to bring up a map, and take it for granted, or consider it just another simple tool (like an inventory, or a compass), maybe stop for a second and think about what else it’s doing.